The biggest threat to American security! Maybe he's afraid of bears? I'm scared of bears. The only wild one I've seen in Michigan was a cub, thank goodness. A guy at my church almost had his head ripped off by a bear. 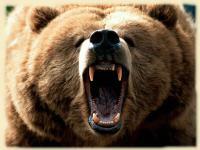 I hear women's periods attract bears. I bet that line gets you all the ladies, huh? go to the virginity thread. It's from Anchorman, I'll go edit so I don't look like that much of a mysogynistic jerkoff. it was sooo cute and fuzzy!!!! OK... you get a Pass on that comment. Any guy under 20 - hell, 35! - who knows the correct definition AND spelling of 'misogynistic' can't be all bad. I just hope Bono isn't anywhere near those bears.